To know Elizabeth Jordan is to wonder where she gets her energy to do what she does. At the age of nearly 75, according to tradition she should have hung up her boots many moons ago, and be happy to sit on her porch and watch the action and the world pass her by. While she has the perfect spot to do that from, she’s usually in the middle of the action, or directing it. The National Sailing Academy was her vision back in 2010 and it has been the sole purpose in her business life for the last 9 years. The creation of a school which would give all children an opportunity to learn to swim and sail on the Schools National Curriculum seemed like a pipe dream when it started, but now in 2018, the school is flourishing and its instructors and students are making an impact on the yachting industry and lives of families all around Antigua as it set out to do. The plan is working! In the beginning the school operated from Antigua Yacht Club (AYC) but soon outgrew the premises. As then commodore of AYC, Elizabeth saw the writing on the wall and began planning for the future. A move in 2013 to the old Hale Inn Hotel site on 1 acre of land was the perfect spot from which to plan operations. Fast forward to today and growing pains are part of the daily challenge. The property is on a long-term lease. The hotel on-site, which in season is full, covers the costs of the school being in that location, but the operation costs as with any educational facility are onerous. Instructors, boats, maintenance and transport to get the kids to and from the school all take its toll. In discussing how she has been able to sustain the school, Elizabeth shared with me some of her strategies. Rental fees from the on-site restaurant, the hotel and a floating dock all provide regular income although it doesn’t totally close the gap to cover monthly remittances, and a government work scheme funds some of the instructors. Jordan says, “The issue becomes that people tend to be happy to sponsor or support capital expenditure such as a sail, a boat or the relatively newly installed swimming pool or floating dock, but they all come with ongoing maintenance needs. And the monthly bills still have to be paid’. Distressingly, there are still schools knocking on the door who want to be on the programme as well as special needs schools such as the Adele School and Victory Centre who could bring double the children if the school had the capacity to deal with them. The maths is simple though, adding more children and schools requires another bus to get the children there, more instructors to be available to teach, and more boats on which to teach them. There is physically the space to do it, but more money is needed. Financially to step up the operation to that level the school would need to raise about US$100,000. In the overall scheme of the benefits, what it would immediately bring back to the economy is peanuts, but for a school that delivers the whole programme for free, it’s an enormous undertaking. Talking of special needs right now in the world of sailing, Para-Sailing has had a disappointing knock back having been informed that Para-Sailing will not one of the Olympic Sports through the next 2 Olympics. For governing body World Sailing that is a blow, but for the National Sailing Academy it is a huge opportunity. The NSA has been selected to host the first Para-Sailing Development Programme in the Caribbean to take place in January. World Sailing will fund the programme which includes shipping in 20 specially designed boats, the Hanse 303, specifically designed to suit para-sailors. The programme will bring instructors and sailing programme managers from around the Caribbean and Central America to Antigua to learn about Para-Sailing. Currently ‘RYA Sailablilty,’ the Para-Sailing programme operating at the NSA, is the only one of its kind in the region, and only one of three outside of the United Kingdom, thanks to Bob Bailey who was the manager of a programme in the UK. Fortunately a grant from the Jumby Bay Foundation was perfectly-timed earlier this year to allow further development to support the Sailabliltiy programme. It includes ensuring there will be wheelchair access to the docks, not currently possible, and a hoist which can swing 180 degrees to lift people from a wheelchair and on to the boat. It’s worth mentioning that this is not just kids, but adults too, and not focused on performance at all. Due to the spectrum of physical and mentally challenged people, it is often about the pure stimulation and joy of movement. Imagine you have lived your life unable to do anything, and suddenly you are flying across Falmouth Harbour feeling the wind in your hair and the weightlessness and wonder that come with it. Really think about it………..this is the experience the NSA and Sailiablilty are doing daily for physically and mentally challenge children and adults across Antigua. And, unusually for a school, they are open on Saturday’s although classes are not run. The difference on Saturday is that any of the children on that years programme can come and sail. The only rule is that they have to get to the academy and back home however they can. The net result is a glut of mad keen children who walk, ride, get the bus, or if they are lucky catch a ride so that they can get a bonus day of sailing each week. Of course, for Elizabeth that comes with an interesting problem as she lives on-site and regularly has kids arriving from 7am, so keen they are to get onto the water. October 15-17, 2019: Resort instructor Programme – 8 hotel watersports staff will be trained by Chief Instructor Sylvester Thomas alongside Ambrose, instructor from AYC. October 26-28, 2019: CSA Caribbean Dinghy Championship – being hosted at AYC, some of the instructors and students are hoping to win the qualifiers to represent Antigua in the event. November, 2019: A schools open day will give parents a chance to visit the academy and check out the great work being done as well as have a tri-sail with instructors. 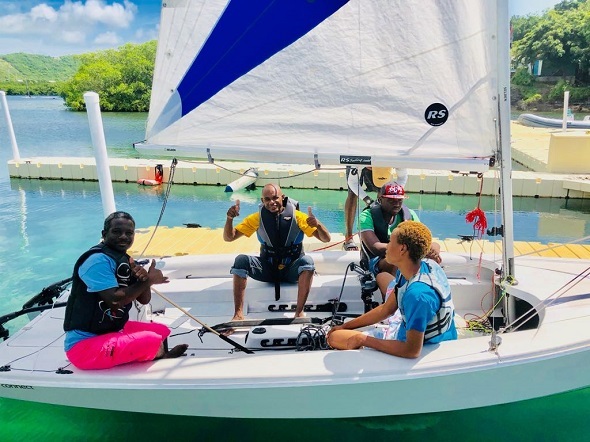 January 25, 2019: Para-Sailing Development Programme – The World Sailing hosted programme for the Caribbean. Feb 24, 2019: The Hare and Tortoise Swim – a 1km swim from the NSA to Pigeon Point Beach and back for an afterparty at the NSA. March 19, 2019: Sailability Super Sunday – the annual fundraiser for the para-sailing programme involves a sponsored walk with many of the kids and adults on the programme, barbecue and live music into the night. Every Saturday: Anyone can also call in from 5 – 7 to join the 100 Club. EC$25 to enter, or EC$100 per month gives you the chance to win the jackpot. Four prizes of EC$100, EC$200, EC$300 and EC$400 are awarded each week to winners. Elizabeth as the founder and President of the NSA works as a volunteer, often for 12 + hours a day. It’s certainly a calling for her. 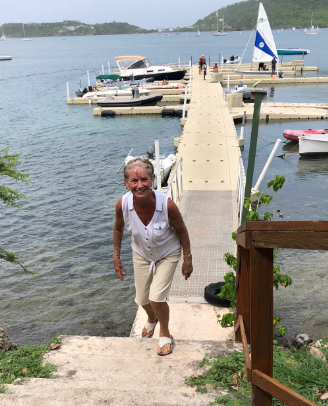 She is a woman on a mission, and nothing will stand in her way to maximise the opportunity for the school to deliver on its mission of making sailing and swimming available to every child in Antigua. She is fiercely proud and supportive of ‘her boys (and now two girls)’ the team of instructors that deliver on her vision daily, and continually seeks out ways to advance their training, their career and assists where possible in networking to get them job placements once they are ready. And what about Elizabeth the woman? She has the advantage that mature people have in life – having seen and done it all, but has far from lost her passion to carry on in her voyage of discovery of life. She has a keen awareness that life is short, but somehow manages to get the balance right between being focused on her goals while giving time and energy to having fun, and making people feel welcome and included in everything that she does. 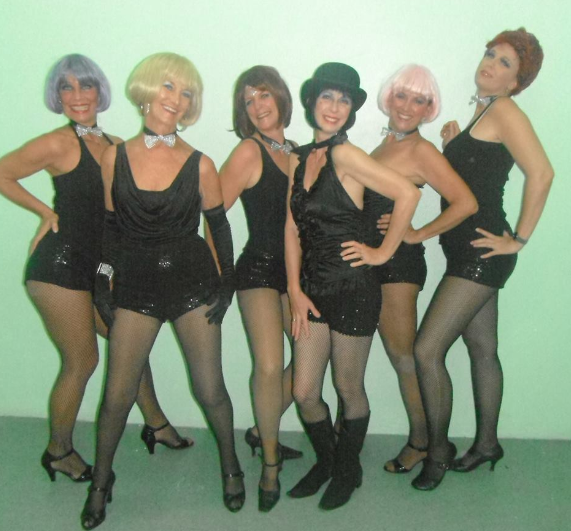 Added to that, given the opportunity she has been known to don a basque and high heels and kick out a mean cabaret show, all in the name of raising more funds for the academy. Her energy and enthusiasm are truly boundless. Even if you are not into sailing, you cannot fail to be inspired by what is happening at the NSA. Take a drive one day and enjoy breakfast, lunch or dinner served on the gazebo overlooking the harbour from the on-site restaurant Island Fusion, and watch the confidence build in the many children and young adults learning the skill of sailing. As for Elizabeth, she’s the kind of woman I aspire to be! Living life with passion until her batteries run out, literally and figuratively. Antigua is incredibly lucky she has chosen to harness her passions so positively to benefit the entire island. If you would like to support the NSA: Aside from visiting the bar and restaurant, hotel and dive shop, adults can take sailing lessons, rent kayaks and SUP boards. Sailing: Try session – US$40/ 3 classes US$100. Kayak: US$20 for single, US$30 for double kayak. Swim against the tide: US$20 in the training pool. Volunteer to teach kids to swim on Saturday mornings. You can also talk to Elizabeth about sponsorship or funding ideas for the school. Get in touch with her by email: info@nationalsailingacademy.org or call: (268) 464 – 2645.